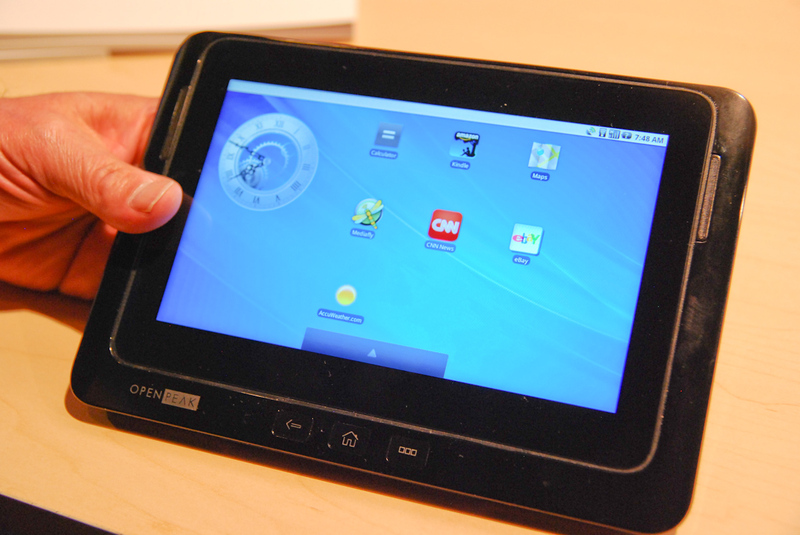 In IDF’s technology showcase, we got a chance to catch up with OpenPeak, makers of the OpenTablet 7, a 7” Android tablet running atop the Moorestown Atom Z6xx SoC. The OpenTablet 7 is a reference design created for ODMs to rebrand and customize as they want. It will be on sale later this year as an AT&T branded product bundled with their 3G connectivity and also serves as the basis for Cisco’s Cius business-centric videoconferencing tablet. We’ve seen the OpenPeak before, having played with an earlier prototype at CES in January, but the real story is that we got performance benchmarks from the Moorestown-based tablet. The OpenTablet 7 itself is not terribly remarkable by tablet standards, beyond the fact that it’s one of the few Moorestown tablets on IDF’s show floor. It has a 7” capacitive touchscreen with a 1024 x 600 resolution (WSVGA) and 170 pixels per inch. The industrial design has changed a bit since Anand looked at it during CES, with the buttons now centered under the screen and speakers moved to either side of the screen. The volume and mute buttons have been repositioned, giving way to the more conventional menu and back buttons. The volume rocker is now on the top of the device, joined by the mute button, a USB port, and a microSD card slot. The bottom of the device has a dock connector, micro-HDMI, and the headphone jack. Interestingly, the prototype we looked at was also missing a front facing camera, though there was a 5 megapixel camera on the back. We snapped a lot of pictures of the device itself and the stock Android 2.1 interface it was running which you can check out in the gallery above. 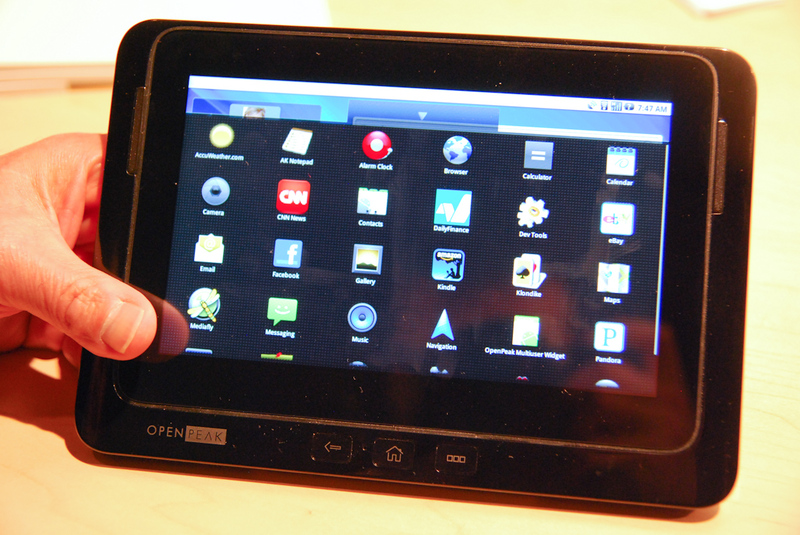 At CES, the OpenTablet 7 was running Moblin v2.1, which has now given way to Android. And like so many other Android devices, it’s running 2.1, with OpenPeak promising a switch to Froyo “soon”. Overall, the UI was very snappy, and scrolling through the home screens and application menus was smoother and more fluid than other Android devices. But what of the benchmarks we promised? Firmware Version: 2.1-update1 on OpenPeak. Excuse how greasy the display is. Even though the device runs Android 2.1, there's no applications marketplace. 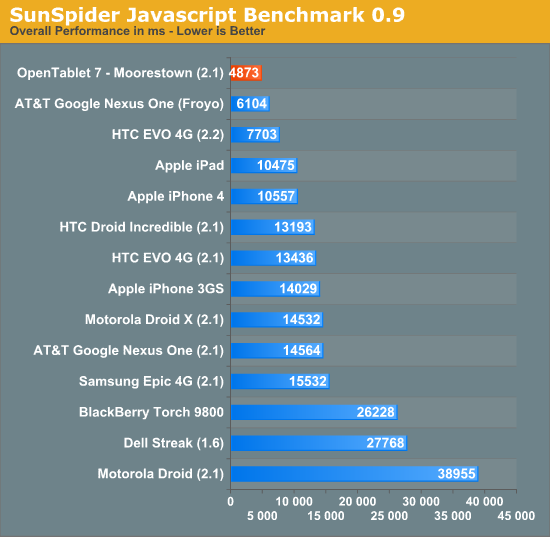 One conceivably could install synthetic Android benchmarking software, but we didn't have the APKs on hand or the time with the unit, and opted to benchmark the browser using SunSpider and Browser Mark. The results are pretty intriguing. We asked the OpenPeak representative for the Moorestown part number and what clocks they had it running at, but he wasn't certain and declined to comment. The rep also stated that battery life target is between 8-10 hours of normal use. 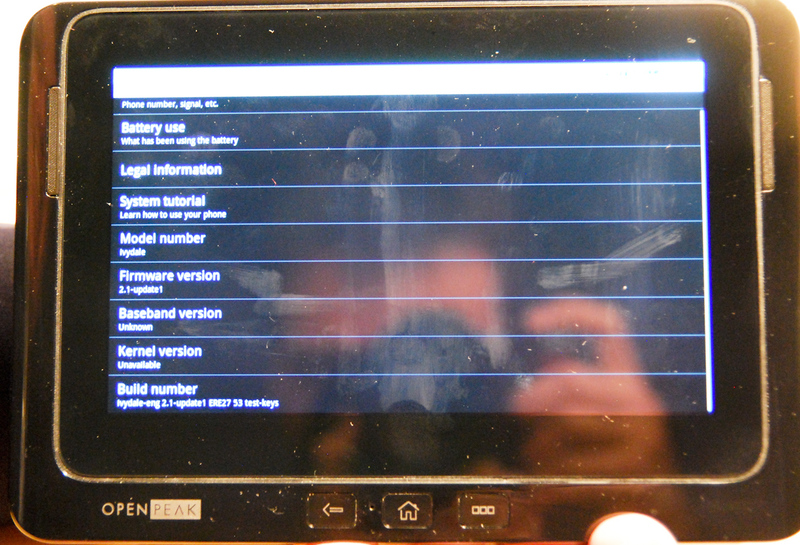 Running stock Android 2.1, the OpenTablet with Moorestown immediately outpaces everything we've seen thus far. The direct comparisons we can make are to other ARM devices running 2.1 like the Epic, Nexus One, Droid X, and EVO 4G. Again, we're not sure what clock speed this is at, but it's at or above 1 GHz. 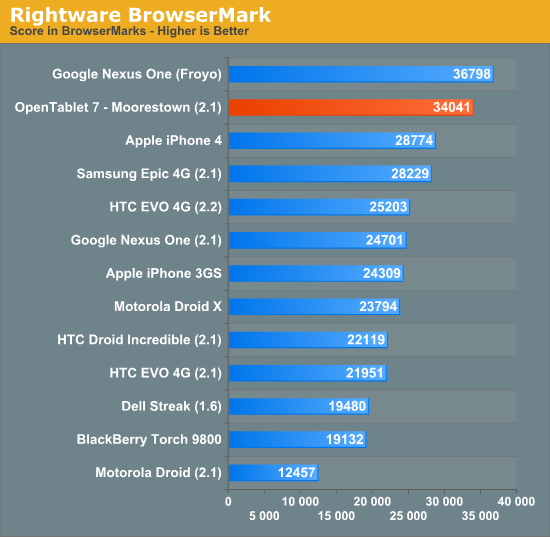 Rightware BrowserMark on Moorestown is similarly good, bested only by Android 2.2's better browser on the Nexus One. It'll be interesting to see just how fast the OpenTablet ends up being after more optimization - especially the AT&T version which hopefully will come loaded with 2.2. We'll be there when that happens and look forward to exploring Moorestown in more depth. Mooretown looks like it will at least beat out the current crop of mobile processors, but what about the next generation? Motorola is supposed to have a 2GHz processor in a phone before the year's end (http://www.engadget.com/2010/06/10/motorola-wants-... and HTC is supposed to have a 1.5GHz dual-core snapdragon for next year (Glacier?). As a tech demonstartion I have so big questions. 1. Wny not Mego Linux? I though Intel was pushing that? Android currently isn't well suited to tablets. 2. Why the low resolution? HD resolution seems to be the new standard everywhere. Why put a 720p panel on a tablet? I am just not seeing anything reall exciting here. Samsung has a it's new dual core ARM based SOC out as does Qualcom. How will this shape up to the new Cortex A9 and don't forget the A15. Intel and Microsoft seem totally lost in the mobile space at this time. I know they both have huge pots of money to throw at it but will they make the effort?